Send a Broadcast when you publish a new blog post! Pushing new posts to your readers automatically is something you should be doing. 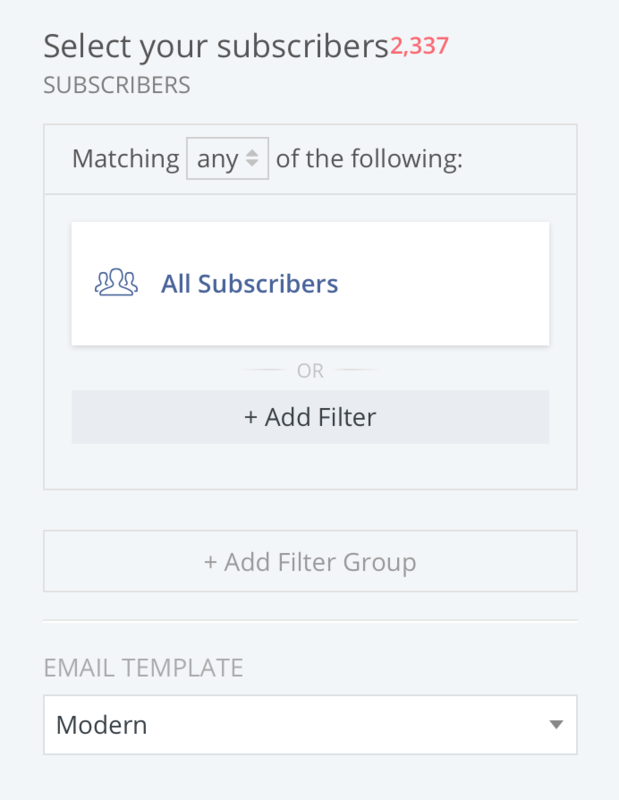 Connecting your blog's RSS feed to ConvertKit will allow your Subscribers to be updated about every new post. You also have the option of setting up a weekly digest that highlights your most recent posts with links back to your blog. Automation never looked so good! Just click Add Feed, and type in the url of your blog/site, followed by /feed. This will check to make sure your feed is valid. NOTE: Your RSS feed is generated by your blog. If your url + /feed doesn't give you the results you were looking for, check with your website service to find the correct link and/or change the format of your feed. If your feed validates, it will appear below as a message, with the Single post option by default. This means you did it correctly! There are two options for your RSS feed settings: Single and Digest. 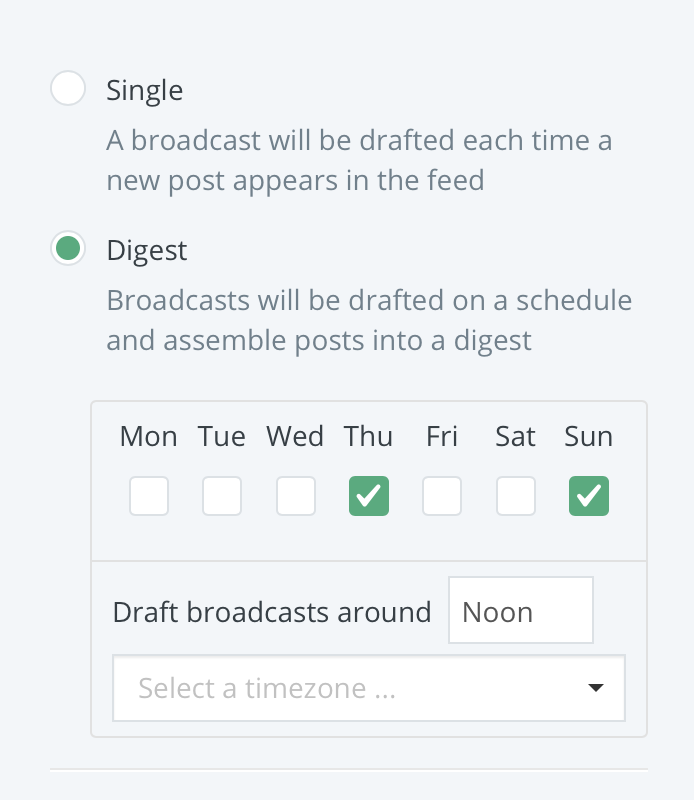 A single post will automatically generate a draft broadcast based on your blog post. It's important to note that this option will include the entirety of the blog post and a link back to your blog won't be included. A Digest creates a "round up" email of recent blog posts, that you can run on a specific schedule. (Usually the most recent three posts are included here.) You can choose more than once a week, or as few as once a week. There is not a way to go less than once a week, at this time. Since a Digest brings over snippets of more than one post at a time, there is a link back to the blog or site, that is provided with this automated Broadcast! First, you'll select your recipients just as you would in a regular Broadcast. When your RSS broadcast is generated, this audience will be set as the recipients by default. 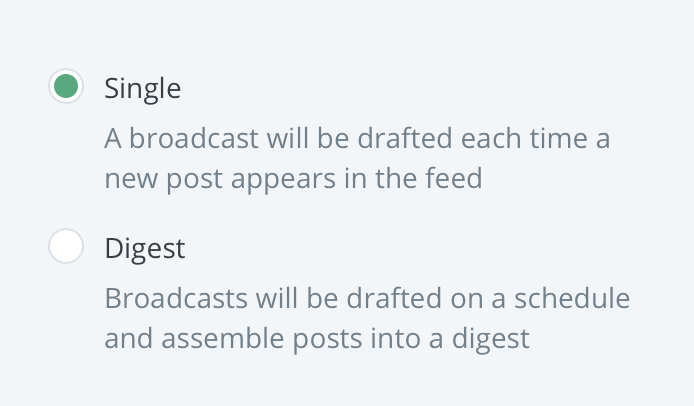 By default, posts will become a draft Broadcast that lets you double check the formatting, title, audience, etc. before sending. However you can also set the Broadcasts to be sent automatically, without review, by checking "send automatically". NOTE: If you check this box, posts will send 30 minutes after they are drafted, with no edits. If you find that your link could not be verified, or that the posts are not successfully being pulled into Broadcasts, there is hope! You can test your feed in any RSS reader. Our recommendation is Feedly.